The photos aren’t that pretty, but you get the idea. The lighting was just horrible in our kitchen today because of a crazy snow storm that just blew in from nowhere. I was really surprised to see how nicely the heart impression turned out on the fabric, I’m thinking of doing a heart stamp on a shirt. Maybe Penelope & I can be twinners with heart-stamped shirts for V-day. I’m thinking of being a little more festive with Valentine’s this year. My mom used to decorate the house to the nines, make a special breakfast & give us Valentine’s gifts for V-day. I might copy her with some heart-shaped pancakes. That is, if I’m not in the hospital giving birth. What are your Valentine’s day traditions? Do you have any good, low-stress ideas for celebrating the blessed/dreaded holiday? Oh my goodness this is so pretty! I love it! 2. Bake in a 375 F oven for 10-12 minutes or until puffed and golden. Cool on a wire rack. If desired, store, tightly covered, at room temperature for up to 12 hours. 3. In a small saucepan combine spreadable fruit or preserves and lemon peel. Heat and stir until melted; cool. In a large mixing bowl combine peaches and blueberries. Add spread or preserves mixture and gently toss to combine; set aside. 5. To assemble pastries, with a serrated knife, cut pastry hearts in half horizontally. Spread each of the bottom halves with about 1 teaspoon cream cheese mixture. Top each with a spoonful of fruit mixture and a pastry top. Serve immediately or cover and chill for up to 4 hours. Just before serving, lightly sprinkle with powdered sugar. 1. Preheat oven to 350F. In a medium mixing bowl stir together flour, cocoa powder, and baking soda; set aside. 4. On a work surface, slightly flatten a chocolate dough ball and top with a peanut butter ball. Shape the chocolate dough over the peanut butter filling, completely covering the filling. Roll dough into a ball. Repeat with the remaining chocolate dough and peanut butter filling balls. 6. Bake cookies in preheated oven for 8 minutes or until they’re just set and surface is slightly cracked. Let cookies stand for 1 minute. Transfer cookies to wire racks; cool. Makes 32 cookies. To store- place in layers separated by waxed paper in an airtight container; cover. Store at room temperature for up to 3 days or freeze for up to 3 months. great way to make use of your gigantor stamp! as for my v-day plans, i think my other half is just taking me out to dinner. but it looks like you’ll be spending it with your loved ones as well.. and maybe even a +1 :) so exciting! love it!! amazing how that big stamp is working out for ya! My husband and I have started a tradition of making a homemade heart shaped pizza and watching a movie every V-Day…totally low key and WAY more affordable than a fancy dinner! I’m doing the heart-shaped pancakes, too! And your banner has inspired me to make a little something to hang over our dining area. My mom always had a fun dinner for our fam on v-day. Didn’t really matter what we ate, but got out the nice dishes and candlesticks. :) I think it was so fun for us, we even dressed up for dinner in our fanciest dresses. Like an at-home dinner party. I may do this starting next year, but since our time is so cramped after work/before my husband goes to work, we will probably just have v-day breakfast together. How fun! 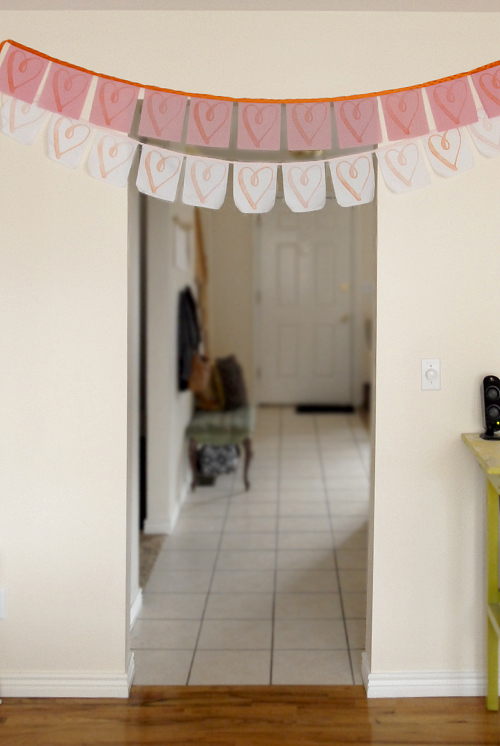 I recently ordered a huge heart paper stamp and am loving it– so many options:) My parents both always did such a great job making valentine’s day special for the fam. I hope to do that when I have kids some day too! There’s nothing I like more than a DIY Decor project that takes less than 15 minutes. Lovely. Love that banner! Makes me want a jumbo stamp for just such occasions.